When you lose a family member, friend, significant other, or loved one it\'s human nature to mourn their passing and have a desire to celebrate and memorialize their life. This desire is what gave rise to funeral customs and burial rituals that have been occurring around the globe for generations upon generations. Interestingly enough, it seems as though each culture has their own traditions when it comes to funerals. 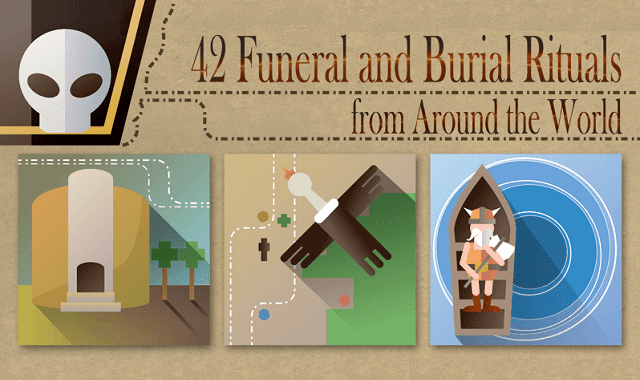 This infographic, from the sympathy flowers and floral arrangements for funerals experts at Avasflowers, examines 42 unique and diverse methods, customs, traditions, and rituals from cultures that are equally as unique and diverse. From the solemn ship burials and claustrophobic catacombs to the lively jazz funerals and head turning air sacrifice, this list includes something you might find to be strange and even creepy but to the peoples and cultures that practice them, they are perfectly normal. Imagine how many of these cultures would think about the burial customs in your culture and family!